To take the lead in the profit performance of your distribution business, you need detailed analysis. Reducing cost drag while boosting profit velocity is the very definition of efficiency —the key to increased cash flow and earnings. WayPoint is what top distribution companies use to make maximum profit performance possible. WayPoint is a companion system that adds advanced cost and profit analytics to any ERP system. You can quickly bring your existing system up to state-of-the-art without retraining your staff or the headaches of a lengthy and expensive transition. With this secure, in-the-cloud system, any of your authorized team members can access hundreds of profit reports from any device. Now everyone can begin work on the unseen profit opportunities that already exist in your business. 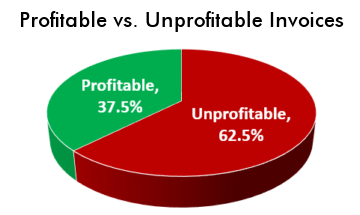 In distribution, most invoices are unprofitable. Shifting this balance is the key to high profit rates. It shows how to make more money without needing to have more sales. It focuses sales on most-likely profitable target accounts for profit share gains. It identifies profit-driving accounts and activities for more focus, and hidden money-losers for elimination. It adds state-of-the-art analytics to their existing systems—no need for expensive and disruptive migrations. They get expert strategy advice and proven tactics to guide their teams. WayPoint is always adding new metrics so you get new insights and reports on your company’s performance. Three of our newest metrics (G2E,P2E & P2C) quantify the efficiency of customer relationships—how much profit is returned for each dollar spent on operations or sales pay. The secret to superior profit rates isn’t getting all the customers—it’s getting the majority of the most profitable ones. With a sophisticated system like WayPoint, you’ll know who those customers are so you can protect those you have, and target those you don’t. for the bottom line (green). Meanwhile, your team can work with lagging accounts, using our strategies to optimize the logistical relationship to control costs. WayPoint shows you precisely what you need. Before WayPoint, distribution companies had to upgrade or change their ERP systems, with all the attendant costs, delays, and loss of focus for extended periods. Now you can add world-class analytics to your existing system, getting all the benefits without disrupting your business. The security and privacy of your company information is important to us. That’s why we use the same security the banks use, and why your company data exists only on our own servers in our own data center, and is handled only by our own bonded employees. You can rest easy. At no extra cost, our senior team is available for consultation, sharing their experience on a broad range of best practices. You get top strategies and expert tactics to quickly and sustainably maximize cash flow and profits. We’re proud of our record, with distributor clients routinely doubling and tripling their bottom line! Your business is making more money than you know, but you’re losing it on hidden costs. Let us show you why WayPoint is the fast-track to changing this dynamic. Get on track in the race for profits. or call 480-426-9955 today ! WayPoint provides relevant information quickly to assist me in making informed decisions regarding customer pricing and profitability.